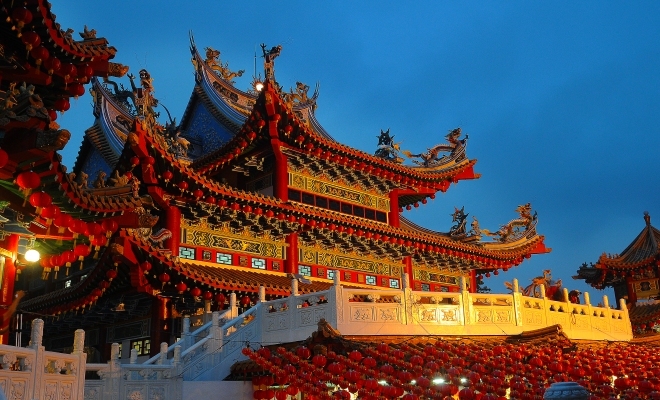 Have you ever considered visiting a Chinese temple while visiting Kuala Lumpur? Well, the Thean Hou temple is waiting for you to drop by. Being one of the most visited not to mention the largest religious sanctuaries in the country; this temple stands magnificent as it shows off the beautiful murals, calligraphy and other beautiful features imported directly from China to beautify the temple. The red columns which stand to erect the magnificent arched red roofs which have dragons surrounding the edges lead the way to the main prayer hall which is located on the top floor. The many rooftops are a common feature of the temple and if you stand here, you can see a breath-taking view of the city. If you go into the temple, do look up at the ceiling as you will be able to see the magical art on the ceiling that makes the temple an enchanting place to be in. You will notice that the temples theme color is red as the Chinese believe that red is the color that symbolizes prosperity. If you were to come at night, the temple is beautifully lighted up, creating a spectacular view of the temple from afar, with its red lanterns and lights that surround the perimeter of the temple. The temple was actually built by the Hainanese group of people who hail from the island called Hainan. They set up the temple as a worship place for their people to offer sacrifices and worship the three main deities of their roots here in the Malaya province. It’s always a relaxing stroll in the gardens that have been well kept at the temple. Besides seeing the lush and beautiful greenery, you will also see a few sculptures that have been featured in Chinese astrology. Besides the twelve animals of the Chinese astrology, take for example the sculpture of the God of Longevity. You will be able to find him holding a peach and a staff. A statue of one of the Deities; Guan Yin stands at the right hand side of the main prayer hall. The deity stands pouring out water from a water jar, symbolizing the blessings that pours out from it. If you are at the temple grounds, do take the opportunity to make a wish at the wishing well. You never know, if might just come true! Or, if you are okay with the idea of having someone tell you what your future holds, why not give the fortune tellers in the temple a try? The temple is also home to a Chinese Medicinal Garden which grows herbs, right here in the temple grounds. The best time to make it to the temple would most probably be during the festival of the Chinese New Year. The Mooncake festival is also a must see at this temple if you are in the city at that time. Wesak Day is also celebrated here. If you are in search of a more traditional and oriental venue to get married, you could consider this temple; a great place to register your marriage.